Critics called the President's bi-partisan summit on health care "political theater," a "charade" and an opportunity for partisan grand-standing. The same could be said for the media coverage of the summit  with the usual suspects lining up in favor or opposed to the proposals and the dialogue. But one group's innovative live coverage of the summit is being called "a game changer" by media watchers. The Sunlight Foundation, an organization dedicated to increasing government transparency, live-blogged the entire discussion. But their commentary wasn't based on opinions and conjectures like the normal television punditry. As Mediaite noted, Sunlight, "gave readers and viewers an endless supply of information  from donor data for members of Congress to information on health care expenditures  by using live-streaming video, live-blogging, Twitter-feeds, and seven hours of endless data." 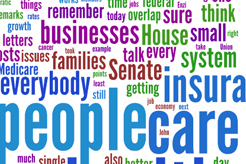 A word cloud (pictured above) started off the event, visually graphing the language the President was using to make his case  a speech where "people" greatly outweighed the "Senate". During the seven-hour event the experts rounded up by Sunlight backed up their statements with immediate links to the analysis and figures, allowing the online viewers to fact-check and delve into the issues as their interests led. The foundation leveraged the data from other watchdog sources like OpenSecrets.org's campaign finance information to create an effect akin to VH1's Pop-Up Video. Health industry campaign contributions appeared under every speaker's (including the President's) name. Easy-to-understand graphs also illustrated who on each member's staff had taken the revolving door from politics to the health care lobby. You can revisit Sunlight's live blogging experience online and the group has also published a very helpful primer of how they achieved their success  with information for other groups to build on. Throughout the reform process the Kaiser Family Foundation has kept up a side-by-side comparison of every plan under consideration. Currently their feature is up-to-date on the House, Senate and Presidential plans. Not only can you see what's in and what's out in each bill, but you can plug in your own financial particulars and see just how much purchasing a plan through the proposed government exchange would cost. See Also: Kaiser Health News: Daily Health Policy Report for policy and media analysis. The Sunlight Foundation utilized data from OpenSecrets.org campaign finance database during their live blogging of the summit. 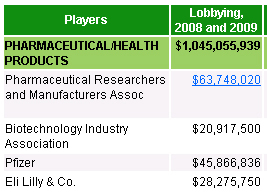 The numbers are large  in just 2009 the industry spent $425,115,711 on lobbying. You can check all the data right down to how much is going to your Congressional representatives with the Eye on Congress tool. Of course money isn't everything  there's also influence. OpenSecrets.org also tracks in its Revolving Door database which former federal employees into the world of lobbying. See Also: The Sunlight Foundation's list of potential vote health care vote switchers. FRONTLINE: "Sick Around the World"
FRONTLINE travels to five other wealthy capitalist democracies  Great Britain, Japan, Germany, Taiwan, and Switzerland  to find out how they provide health care to all of their citizens for a fraction of the cost of the U.S. system. 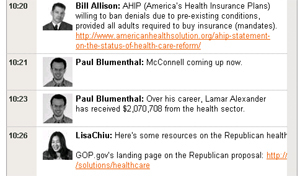 Explore highlights on the debate over health care reform and get tools to track industry lobbying and campaign dollars. Bill Moyers sits down with former insurance executive turned public health advocate Wendell Potter, who argues that all is not lost in the healthcare bill and details what he likes about the legislation. Single-payer advocate Marcia Angell on why she thinks the debate over reform needs a fresh look at the economics and delivery of the care promised in the bill. Online tools for side-by-side comparison of the reform proposals, cost calculators and expert analysis of political speech and the bi-partisan summit.